Scientist invented a technology to obtain Bio Activated Energy from natural resources and it is infused into an unknitted material whereby it is enclosed in a golden colored foil and sealed with quality plastic. 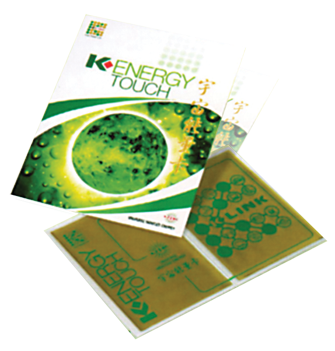 BAE Power Touch can provide and improve the quality of health. Help retain freshness of vegetables, fish, meat, drinks and canned food and also improving quality and taste of food and drinks. By placing the BAE Power Touch on affected body parts, it helps normalize organ functions and reduces aches and pain. The energy also assists in preventing unhealthy cells from multiplying. Enhances the functions of electrical appliances and the performances of gas stoves. Absorbs bad odor or smells in the refrigerator. BAE Power Touch can be placed underneath the pillow for a good deep sleep or sleeping comfort and recommended for insomnia sufferers. Transforms dangerous electromagnetic waves from household appliances to be harmless. Also reduces tar and nicotine level in cigarettes.